To be honest, it wasn’t my first trip to Corsica however it was the first time I actually stayed there and explored the island’s properties. Let me say one first: it’s not the Cote d’Azur since it lacks that superficial feel and it’s not the Atlantic Coast neither - Corsica is just different. You will see significant differences such as the flag, the food and the wines. The people on the island support their “own” economy and go completely local. You will only drink local water & wine and don’t even dare to look for Foie Gras. When I was well aware of all this, lying under a pine tree on the beach of Cala Rossa, somewhere near the port of Porto Vecchio that sounds more Italian than French, it was already time to leave for the last property I tested on Corsica. A roughly two-hours drive from the deepest South to the North, passing by the old capital Corte was what opened my eyes and told myself that Corsica has actually as much in common with France as it has with Italy: and that is very little. My final and grand highlight of the trip was the Relais & Chateaux Hotel La Villa. 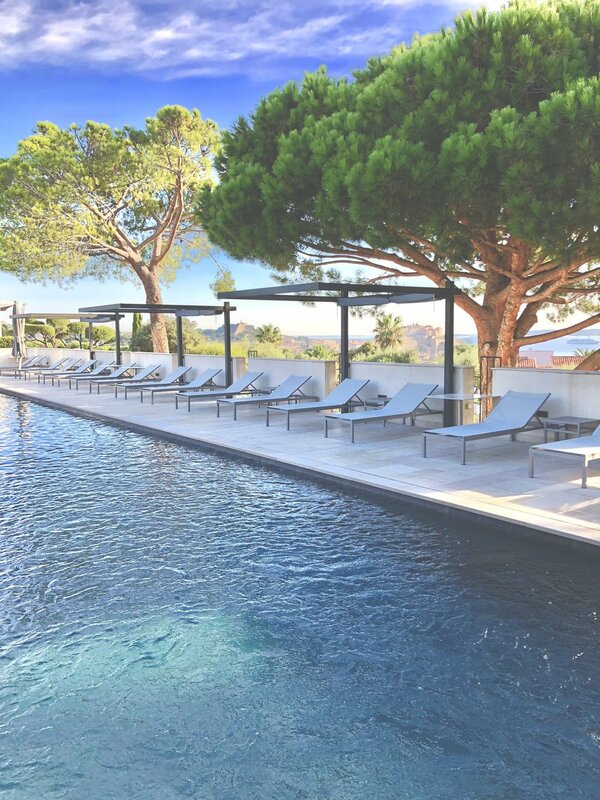 High above the town of Calvi, this worldclass property comes along with all the amenities you expect of a grand hotel. When I enter the lobby and they use the same corporate smell than The Ritz Carlton, it immediately gives me the feeling that this property is a really impressive place. Lukas and me are in love with Ritz Carlton and one can say it is my favorite hotel brand even before Aman and Four Seasons. So I entered that amazingly smelling lobby and was welcomed in a very friendly way before I was accompanied by the lady from the front desk who showed me to the restaurant, bar, spa and finally to the newly renovated building where my amazing Deluxe Room was located. It was nice to see a beautiful decoration in the hallway displaying hotel branded products (The problem for me since I cannot leave without buying at least one of these amazing beach totes). Once the lady from the front desk opened the door, I found a very spacious and chic entree with lots of wardrobe space to my right and the entrance to the marble bathroom on the left. While the bathroom reminded me a lot to the one at Corinthia London, the toiletries were not too amazing and not really worth paying any surcharge for overweight luggage. In general the bathroom comfort was really good with double vanities, a deep bath tub, walk in shower and a variety of bath amenities. I loved the separated toilet between the bathroom and the main bedroom. Talking about likes, I have to point out that I totally fell in love with the wonderful bedroom. Not only was the bed extremely comfortable, but also the two designer chairs were stunning as was the sideboard with the TV and the two floor lamps which I would have loved to take home (no worries they are still there haha). By chance I found two more pillows in the wardrobe and I placed them on the bed making it the even more comfortable and unique. At least it looked perfect on the picture. And I didn’t talk about the view. Oh my god, the view was just unbelievable. Overlooking the private pool of my house (the hotel is split up into different houses each hosting a few rooms only) and going towards the Citadelle of Calvi onto the Mediterranean. My parents were allocated the room next door (though they couldn’t hear any noise) and my father spent several hours digesting that stunning view after dinner. He said that he can’t remember the last time that he was so blown away by a view. In fact the old medieval citadelle on top of the hill falling into the blue of the Mediterranean could easily be a drawing as well. Really, the hotel couldn‘t have been positioned any better and paired with the wonderful design that was just on par with 2018, I wouldn‘t choose any other property in the North of Corsica than La Villa Calvi. Especially the housekeeping was doing a really good job and even refilled the beach bag with towels and a huge bottle of water. The small patio of my room added advanced relaxation space and I could directly access the pool as well. Generally the entire property made a flawless impression and the four pools spread over the grounds resulted in a less crowded main pool which by the way was just spectacular. There was a poolside grill restaurant for lunch which served a slightly lighter menu while the main highlight of La Villa Calvi is their signature Michelin starred main restaurant overlooking the entire property and the sea with the citadelle. Breakfast is served inside the Michelin restaurant as well as on the terrace, which however couldn’t be used as there was a massive amount of bees. We decided to stay inside and in fact it was more convenient as the buffet was not that far and it felt more sophisticated in terms of atmosphere. All table cloths are pressed before each service so it looks very tidy. Service was also good, though the coffee was not on par with the quality of the food. A spacious buffet was set up in a room that was constantly cool so none of the products was harmed by the hot temperatures. I loved their bread selection along the many pastries - welcome to France! Cold cuts and cheeses were great as was the egg dish served to the table. I felt that they were a bit understaffed however we always received what we wanted. La Villa Calvi offers a scheduled shuttle into town though we took our own car as it was more convenient and did not need to rely on a shuttle. Even though La Villa Calvi has one of the fanciest restaurants in Northern Corsica, I was in for something local and authentic so we went to the coolest find of our Corsica trip. Situated a bit off the old town, Casa Vinu is a go-to-place but remember to make a reservation especially for weekends. I had an excellent sleep in the heavenly beds of La Villa Calvi and though we didn’t leave too late for Bastia, we got into a terrible traffic queue and therefore nearly missed our ferry back to Italy. However the ferry company called us when we drove into the harbour and in the very last minute, we drove up the gateway which was already closed. Seconds later it opened all of a sudden and we boarded the ferry a minute before we left Corsica and also French territory to be back in Italian Seas. Needless to say we were the last car entering. Even though I stayed at the very best places on the island and would definitely stay at the hotels again, what is left to say is that Corsica is very pricey and also very different in terms of scenery but outrageously beautiful and definitely worth the splurge - after all the Cote d’Azur doesn’t come for free neither. We were guests of the Hotel La Villa Calvi and our stay was supported for editorial purposes. All above written expresses our own opinion and has not been influenced.